AOMEI Partition Assistant Standard is a free disk partition management application. The program offers you multiple wizards and tools for changing the parameters of your partitions. 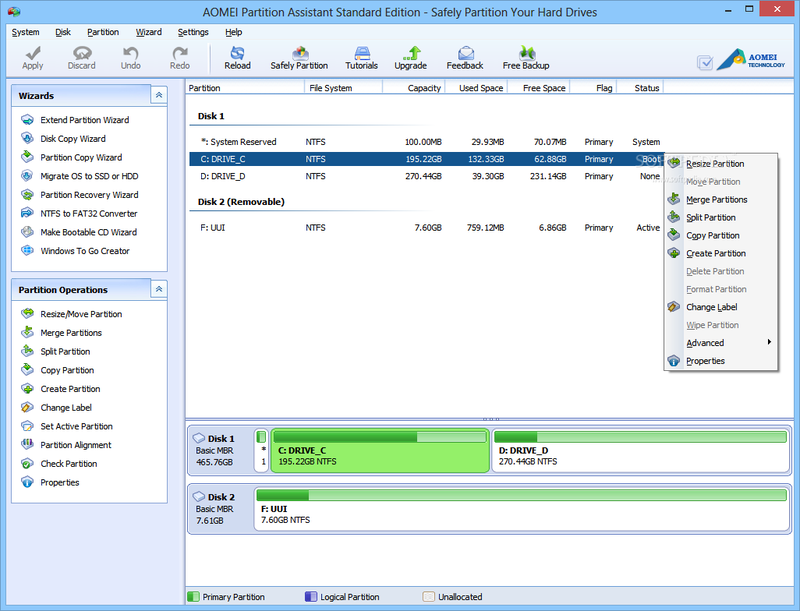 AOMEI Partition Assistant Standard Edition´s user interface is similar to other partition managers, with a list of tasks displayed on the left side while drives and partitions are displayed on the right. We selected the partition or drive we wanted to work on and then applied the relevant action by selecting it on the task list. Some of the options include making a copy of your disk, extending a partition, creating a Windows To Go disk, and a partition recovery wizard. AOMEI Partition Assistant embeds sector-level data protection technology, which allows you to accomplish more partitioning operations.